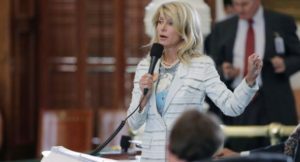 WASHINGTON — The liberal mainstream media rallied behind Texas state senator Wendy Davis, who filibustered a pro-life bill in the Texas legislature this past week. CNN praised her as a “teen mom to Harvard Law to famous filibuster” and Salon’s Joan Walsh calling her a “feminist hero“. Think Progress called the filibuster “epic“. As National Review Online’s Kathryn Jean Lopez noted, liberals exploded on Twitter with the hashtag #StandWithWendy and pushing more dialogue on the #SB50 bill (which was the legislature’s official hashtag for the pro-life law). Lopez also pointed out how the liberal media also focused on how Davis wore pink sneakers during the filibuster and not the facts about abortion. In CNN’s profile, the writer talked about how Sarah Palin once wore pink sneakers to bring Republican feminism to the forefront. SB50, as the bill is called, was to protect unborn children after 20 weeks of age in the womb. Little does the liberal media reveal how the majority of women are against abortion, as the Weekly Standard reported that only 27% of Americans support second-trimester abortions and a measly 14% support third-trimester abortions. An overwhelming 62% of Texans supported the bill’s passage. Texas Republicans ended her filibuster when it was determined she strayed from the topic of sonograms, but the damage had already been done in the liberal media’s eyes. The 13-hour filibuster dominated the day’s news cycle and liberals heaped praise on the state senator.